Do your kids know the theme song of the the TMNT series on Nickelodeon? Do they recreate their favorite scenes from the recent Ninja Turtle movie? Then prepare yourself for the easiest holiday season ever. Playmate Toys has got you covered with a brand new line of amazing Ninja Turtles action figures and remote control characters based on the popular television series and movie. 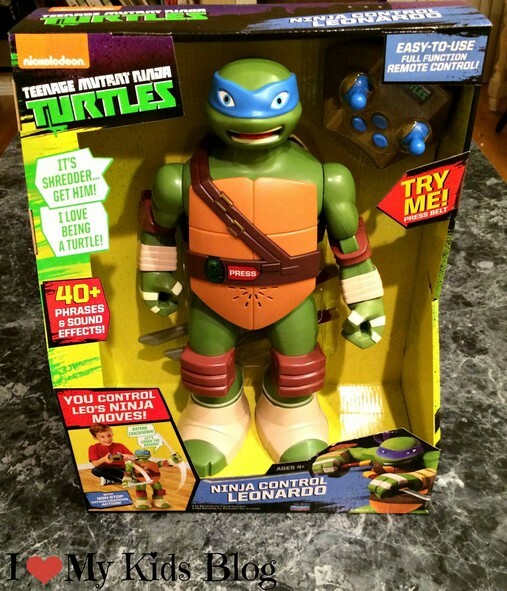 Now your children can battle the evil Shredder right alongside the Teenage Mutant Ninja Turtle Giant Ninja Control Leonardo. 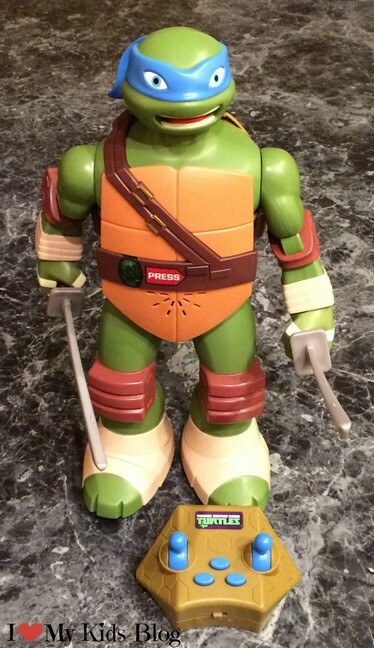 The 13” Leonardo comes with both of his signature katana so he can slice and dice the Foot Clan. Ninja Control Leonardo says over 40 of his signature catch phrases and sound effects from the show. Leonardo also comes with a full-function IR remote that allows your child to easily control and direct his every move. Leonardo can move forward, backward, and a full 360 degrees, so he is sure to catch every one of Shredder’s minions. The remote also has three buttons that send Leo into one of three pre-programmed ninja combat routines. 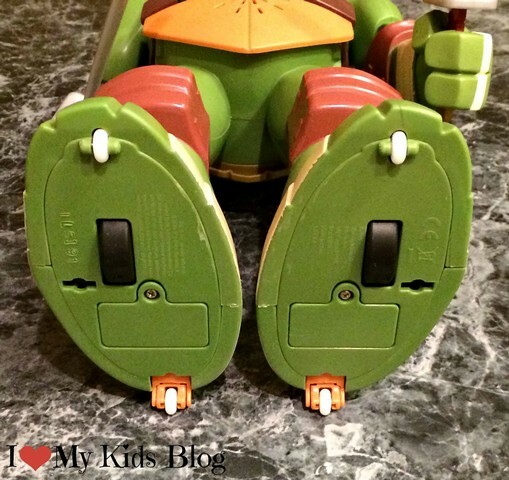 Ninja Control Leonardo requires 2 button cell batteries, but they are included, so your child can play with Leonardo right out of the box. It took a little bit to get the hang of the remote control, but once we figured it out, it was fun to watch Leonardo spin. He moves very quickly, and while he is racing around his head will move side to side and his katana will slash. 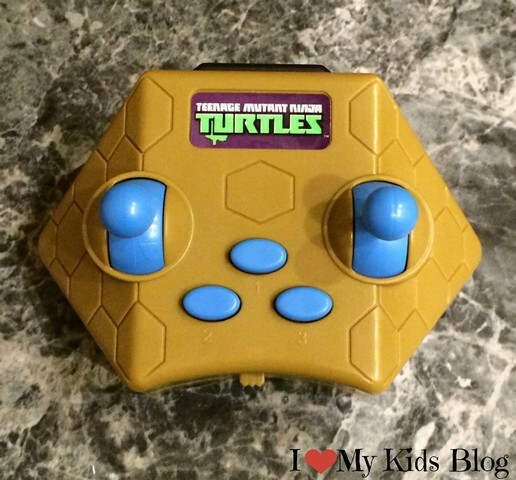 These additional features made him much more fun than a traditional remote control toy. I loved that he was ready to play right out of the box. This will make your holiday much easier without having to worry about batteries. 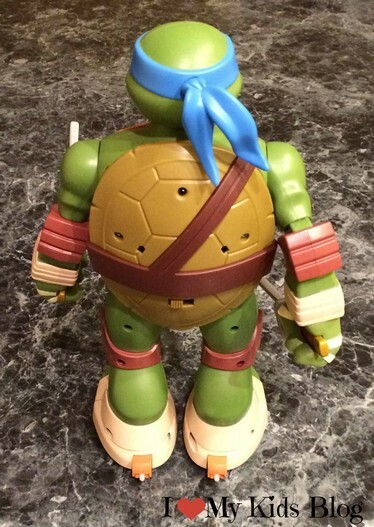 TMNT Giant Ninja Control Leonardo is available at retailers nationwide for $59.99. It is recommended for children ages 4+. Playmate Toys also has the Ninja Turtle to Weapon figures. 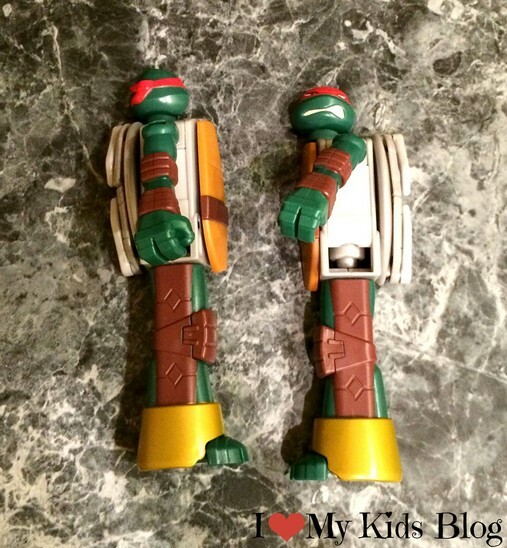 The collection includes Leonardo, Michelangelo, and Raphael. Each figurine is fully articulated and ready for ninja action. 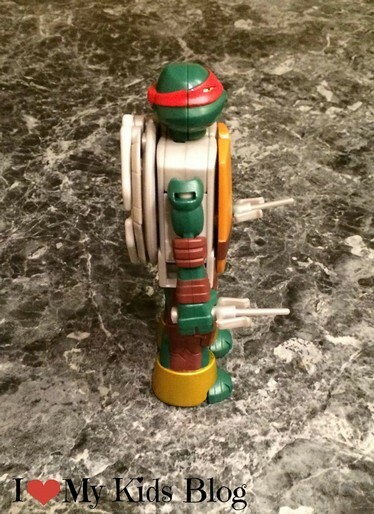 I received the 6” Raphael figure that transforms into twin sai. Raphael came with very detailed instructions on how to transform into the sai. It took about 8 steps and five minutes to complete the transformation. Some of the steps were kind of tricky, and your child may need some assistance. 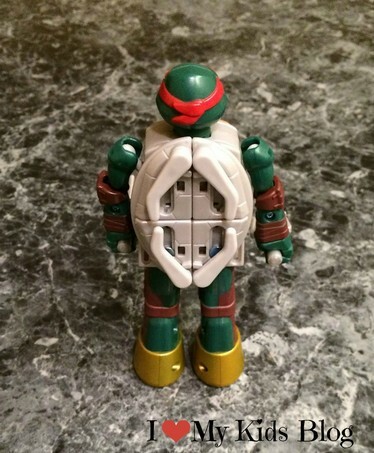 The Raphael figure is very sturdy and ready to take on Shredder and his gang, but the sai are a little more delicate. The blade of the sai recedes into itself, so if your child hits anything with a lot of force on the blade, it will need to be re-extended. The sai were the perfect size for my children’s hands. 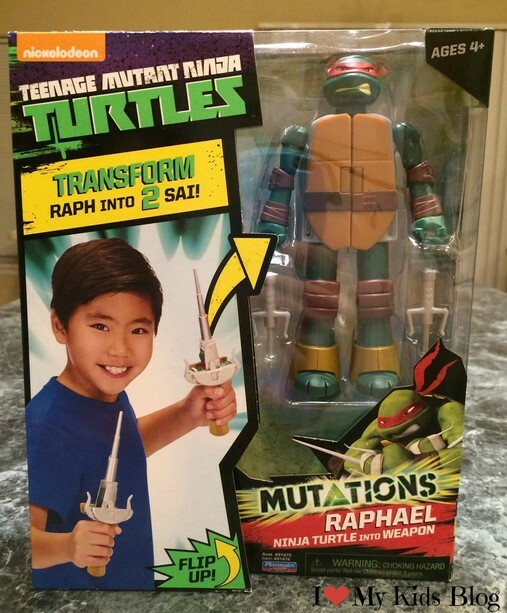 They thought it was fun to get a chance to wield Raphael’s sai, instead of just watching. 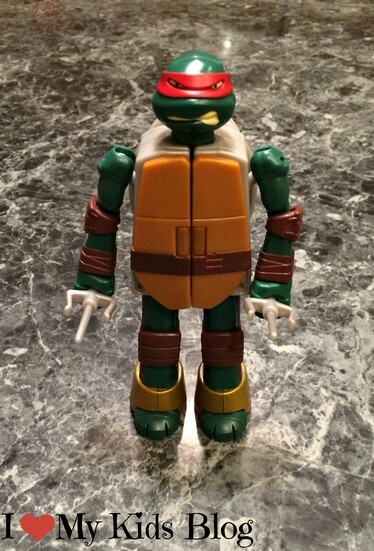 The size of the Ninja Turtle to Weapons Figures make them a great idea for a stocking stuffer. 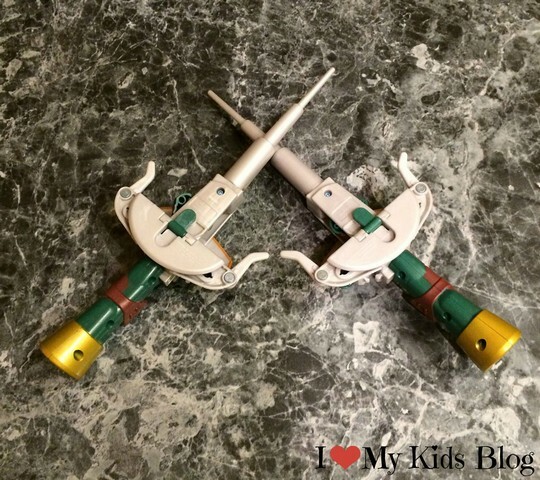 They are recommended for children ages 4+. Disclosure: I received the previously mentioned figures to facilitate a review. Regardless of our arrangement, all opinions are honest and my own. « It started out like a regular caramel apple, then she put this on and the result is adorable!